Miller S.J., Thomas W.P. Coil embolization of patent ductus arteriosus via the carotid artery in seven dogs // J Vet Cardiol. 2009 Dec;11(2):129-36. This study was designed to evaluate the feasibility and limitations of transcatheter embolization coil occlusion of patent ductus arteriosus in dogs using a carotid artery approach. Seven dogs examined at the University of California, Davis Veterinary Medical Teaching Hospital in 2002-2003 for evaluation of heart disease had congenital patent ductus arteriosus diagnosed by characteristic physical, electrocardiographic, radiographic, and anatomic and Doppler echocardiographic findings. Dogs were anesthetized for transesophageal echocardiography and transcatheter coil embolization of the ductus via the right external carotid artery. Coil embolization was achieved in all seven cases, using one to four detachable embolization coils. There were no major complications. Minor complications occurred in two dogs (additional coils placed using a femoral arterial approach and coil embolization of a left femoral artery branch). One dog was examined only 24 h post-operatively and had no murmur and trivial residual ductal flow by Doppler echocardiography. The other 6 dogs were clinically healthy when examined up to three years post-intervention. One dog had a very soft continuous murmur and mild residual ductal flow; the other five had no audible continuous murmur, with only one dog having trivial residual ductal flow identified by Doppler echocardiography. 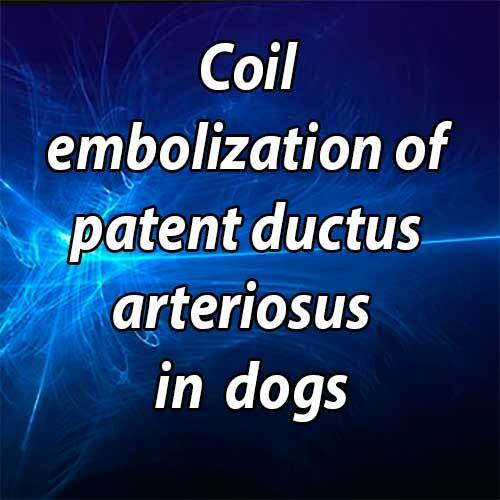 Although technically challenging, coil embolization via the carotid artery is a viable alternative approach for transcatheter closure of patent ductus arteriosus in some dogs. Patent ductus arteriosus (PDA) is the most commonly diagnosed correctable congenital cardiovascular defect in the dog.1 Since the 1950s, standard treatment for patent ductus arteriosus has been surgical ligation via left thoracotomy.2-4 Over the past 10 years, transcatheter closure of PDA, using Gian- turco-type flexible coils or other devices, has become increasingly common in both human and veterinary patients.5-23,25-29,31 Coil embolization is less invasive than surgical ligation, resulting in less post-operative discomfort. The most common approach to transcatheter coil PDA embolization is via a femoral artery. This approach provides an optimum angle for catheter passage from the descending aorta into the patent ductus arteriosus, requiring minimal catheter maneuvering to deliver the coil(s) (Fig. 1A). One limitation of the femoral artery approach is the small size of many affected dogs at the time of diagnosis and the resulting small caliber of the femoral artery compared to available catheter systems for delivery of 'detachable’ coils (4-5 French).c This problem is further compounded when a small dog has a large left-to-right shunt and a ductal size that requires a wider and/or stiffer coil than can be delivered through the small artery. We hypothesized that an approach through a larger access artery might allow insertion of a larger caliber catheter and coil system and facilitate ductal embolization in some dogs. The most readily accessible peripheral artery with a caliber wider than the femoral artery in dogs is the external carotid artery. We therefore studied the feasibility and limitations of using a carotid artery approach for transcatheter coil embolization of patent ductus arteriosus in a group of 7 dogs. Seven young dogs were referred to the University of California, Davis Veterinary Medical Teaching Hospital for evaluation of a heart murmur. The average weight and age of the dogs at the time of coil embolization were 5.6 kg (range 2.2-11.0 kg) and 3.8 months (range 2-5 months). Four dogs were standard dachshunds from the same litter, one was an unrelated standard dachshund, one was a Coton deTulear, and one was a Newfoundland retriever. Patent ductus arteriosus was diagnosed by characteristic physical, electrocardiographic, radiographic, and anatomic and Doppler echocardiographic findings. All dogs had grades 4-5/6 continuous murmurs heard best in the left axillary region and bounding femoral artery pulses. Electrocardiograms on the related dachshunds and the Coton de Tulear showed increased R wave voltages (3.0-4.5 mV) in leads II and V4, consistent with left ventricular enlargement. An electrocardiogram was not performed on the other dachshund and Newfoundland retriever. Thoracic radiographs showed varying degrees of car- diomegaly with left atrial enlargement, pulmonary hypervascularity, and ductal aortic bulge on the dorsoventral projection. Two-dimensional (2D) and color-flow Doppler echocardiography in left cranial parasternal views identified a conical PDA in all dogs, with a continuous turbulent retrograde jet in the main pulmonary artery originating from the ductus. The average peak instantaneous velocity of the PDA jet by continuous wave spectral Doppler was 4.6 m/sec (range 4.1-5.1 m/sec). The Newfoundland retriever also had severe subaortic stenosis. No other abnormalities were identified in the other 6 dogs. (A) From a femoral artery approach the gently curved catheter is easily passed from the descending aorta into the ductus. (B) From a carotid artery approach the catheter must be tightly curved to overcome the acute angle between the ductus and aorta. This results in limited maneuverability of the catheter tip from this approach. LSA = left subclavian artery, BCT = brachiocephalic trunk, AA = ascending aorta, DA = descending aorta, PA = pulmonary artery, D = ductus arteriosus. Dogs were anesthetized using one of two main protocols, chosen at the discretion of the anesthesiologist. Dogs were premedicated with one of the following combinations; glycopyrrolate (0.01 mg/kg SQ) and morphine (1 mg/kg IM), atropine (0.03 mg/kg SQ) and morphine (1 mg/kg SQ), or atropine (0.02—0.05 mg/kg SQ) and oxy- morphone (0.05—0.1 mg/kg SQ). Anesthesia was induced with fentanyl (8—17 mg/kg IV) and midazolam (0.3—0.4 mg/kg IV) or etomidate (0.4— 0.9 mg/kg IV) and midazolam (0.05—0.25 mg/kg IV). Most dogs that received fentanyl and midazolam for induction were maintained with a continuous fentanyl infusion (0.25—0.7 mg/kg/ min). Those induced with etomidate and midazolam also received a continuous dopamine infusion (2.5—7 mg/kg/min). Maintenance anesthesia was achieved using isoflurane in 6 dogs and sevoflurane in 1 dog. Six of 7 dogs were mechanically ventilated. All dogs received intravenous fluids at 5 mL/kg/hr during the procedure and perioperative antibiotics. Arterial pressure, end tidal CO2 and oxygen saturation were monitored throughout the procedure. A post-operative opioid injection was administered to 4 dogs. Prior to coil embolization, transesophageal echocardiography (TEE) was performed on 6 dogs (Dog 6 was too small for the adult TEE transducer) to evaluate the morphology of the ductus and to attempt to measure the diameter of the ampulla and the minimum diameter of the ductal opening.30 The ampulla was defined as the widest part of the body of the ductus. Average ampulla diameter was 7.8 mm (range 5.5—10.2 mm, n = 6). Average minimum diameter of the ductal opening was 2.6 mm (range 1.7—3.6 mm, n = 6). Following TEE, dogs were placed in left lateral recumbency, and an area from just below the mandible to the thoracic inlet was clipped and aseptically prepared. The right external carotid artery was isolated and ligated distally. An end-hole catheterd between 4.1 and 6.0 French (Fr), and recommended by the manufacturer for use with the embolization coils, was inserted into the carotid artery and fluoroscopically guided into the descending aorta at or just cranial to the aortic opening of the ductus (Figs. 1B and 2A) An angiogram was performed using 0.5—1 mL/kg of iodinated contraste (Fig. 2B) and the junction of the ductus and pulmonary artery was identified and marked on the screen as a reference point. The catheter tip was then positioned at or just caudal to the aortic end of the ductus. In the first dog, an unmodified catheter with minimal curvature (similar to the catheterin Fig. 1A)wasinitially used. Subsequently, catheters were manually modified to create a sharper curve at the tip to reduce the acute angle between the catheter tip and the ductus (Figs. 1B and 2A). The first coil had 2—3 loops and its width was chosen by multiplying the minimal ductal diameter by 1.5—2. Selection of additional coils was based on the authors’ experience; most had £2.5 loops and were of the same or thinner wire gauge and narrower loop width than the initial coil. Each detachable coil was deployed into the PDA using the appropriate coil positioning catheter (0.035" or 0.038" x 120 cm)f (Fig. 2C, Table 1). The 0.052" non-detachable coilg in Dog 2 was delivered using a 3 Fr 120 cm myocardial biopsy forcepsh to grasp the end of the coil and control its delivery through a 6 Fr, 48 cm long intravascular sheath.i All coils were positioned entirely within the ductus, with no coil loops in the pulmonary artery. After each coil was deployed, echocardiography and/or angiography were repeated to assess residual ductal flow (Fig. 2D). If residual flow was significant and an additional coil could not be deployed from the carotid approach, a femoral artery approach was used to place the required additional coils. The procedure was terminated when residual ductal flow ranged from none to very mild (small amount of flow that did not extend to the pulmonic valve). All dogs were evaluated by auscultation, thoracic radiography and echocardiography on the morning following the catheterization procedure. Attention was given to the presence or absence of a murmur, coil position on thoracic radiographs, and residual ductal flow estimated subjectively using color-flow Doppler echocardiography. Residual flow was classified using a previously described grading scheme: grade 0 = no residual PDA flow in the main pulmonary artery, grade 1 = trivial flow adjacent to the entrance of the PDA to the main pulmonary artery, grade 2 = mild flow seen as a narrow jet in the main pulmonary artery that did not reach the pulmonic valve, and grade 3 = moderate flow seen as a jet in the main pulmonary artery that reached the pulmonic valve.25 Subsequent post-operative examinations were limited to auscultation and echo-Doppler examination. 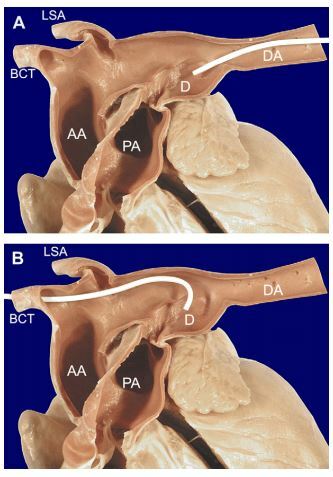 (A) Position of the modified Cook MPA catheterd with the tip at the opening of the ductus (compare to Fig. 1B). (B) Angiogram prior to coiling. (C) Position of the catheter during coil deployment, demonstrating an acute angle between catheter and coil. (D) Angiogram following coil placement, showing complete ductal occlusion. AA = ascending aorta, DA = descending aorta, PA = pulmonary artery, D = ductus arteriosus. One to four coils were successfully deployed into the patent ductus arteriosus of each dog from the carotid artery approach (Table 1). In Dog 1, an unmodified, minimally curved end-hole catheter recommended by the coil manufacturer (similar to the catheter in Fig. 1A) was used to deliver a 4-loop coil from the carotid approach. In this dog, most of the coil was successfully positioned in the ductus but a portion of the last loop remained curled around the crista reuniens in the ventral aorta and could not be maneuvered into the ductus. An attempt to deliver a second smaller coil from the carotid approach was unsuccessful. Consequently, a traditional right femoral artery approach was used to deliver 2 additional coils to complete the occlusion (Table 1). Beginning with Dog 2, catheters were heated and molded to create a sharper curve at the tip to reduce the acute angle between the catheter tip and the ductus and to facilitate directing the coils into the ductus (Figs. 1 Band 2A). All coils in Dogs 2—7 were delivered through the modified catheters, which made it easier to direct the coil ventrally from the aorta into the ductus. In Dog 2, a 0.038" coil delivered through a 5 Fr catheter would not stabilize in the ductus, but a 0.052" coil was successfully deployed using a 6 Fr catheter. Using the modified catheters, deployment of the first coil was accomplished relatively easily in each dog, although the ability to adjust the position of the catheter tip and coil orientation relative to the ductus anatomy was more limited than from a femoral artery approach. A singlecoilwas successfully deployed and occluded the PDA in Dogs 2, 3, 5, and 6. Positioning and deploying additional coils were more difficult than from a femoral approach. However, a second coil was deployed in Dog 4 and 3 additional coils were deployed in Dog 7. There were no major complications (arterial perforation, hemorrhage, or death) in this series of dogs. Minor complications occurred in 2 dogs. In Dog 1, one coil was delivered via the carotid artery, but attempts to deliver additional coils from this approach were unsuccessful. Subsequently, two additional coils were delivered via a femoral artery approach. Following successful deployment of 1 coil in Dog 4, an additional small coil embolized to a left femoral artery branch. This occurred when there was difficulty positioning the coil and it released prematurely from the positioning catheter in the middle of the ductus without being secured next to the first coil. A second attempt to deliver another small coil was successful. The embolized artery was examined by 2D and color Doppler ultrasound and found to have persistent flow through the site, so no attempt was made to retrieve the aberrant coil. The results of post-operative auscultation and color Doppler echocardiographic examinations are shown in Table 2. At 24 h post-intervention, two dogs had no murmur and no residual ductal flow, two dogs had no audible continuous murmur and grade 1 residual ductal flow, and three dogs had a grade 2/6 continuous murmur and grade 2—3 residual ductal flow. At 2 months post-intervention the examinations were unchanged in two dogs. At 11 months post-intervention, 2 dogs had diminished murmurs and residual ductal flow. At 3 years post-intervention, dog 4 had no audible continuous murmur and no residual ductal flow, but continued to have a grade 5/6 left basilar systolic murmur from severe subaortic stenosis. Color Doppler imaging showed persistent flow through the embolized femoral coil. Dog 6 was lost to further follow up. Currently available embolization coil systems come in a limited number of wire gauges, coil diameters and lengths, and associated catheter sizes. Successful coil occlusion may be affected by shunt magnitude and vascular access size. Many puppies of the dog breeds predisposed to patent ductus arteriosus are very small (<5 kg) when first diagnosed. As a result, the femoral arteries of these dogs are also small and may only allow insertion of the smaller caliber catheters used for coil delivery (3-4.1 Fr). The smallest available coil system uses 0.025" coils delivered through a 3 Fr catheter, and this system may be used for very small dogs, as reported by Hogan et al.14 In that study, very small dogs were selected with small minimal ductal openings, yet 2 of 10 dogs experienced coil embolization into the lungs and there was one death. If a very small dog has a comparatively large patent ductus arteriosus, available 0.025" or 0.035" coils may not be wide enough or stiff enough to lodge securely in the ductus, increasing the risk of pulmonary embolization of the coil. Access to a larger caliber artery might facilitate delivery of larger, stiffer coils (0.038" or 0.052") in such patients, reducing the chances for pulmonary coil embolism. The largest readily accessible peripheral artery in the dog is the external carotid artery, which has been frequently used for other types of left heart catheterization procedures.24 It is consistently wider than the accessible region of the femoral arteries in young dogs, and it is easier to manipulate when isolated. The first problem with the carotid approach was the acute angle between the pre-ductal aorta and the ductus. We found that it was technically more difficult to direct and deploy coils into the patent ductus arteriosus from this approach compared to the femoral artery approach, especially if the recommended catheter was used without alteration. We found that it was easier to deploy coils using a modified catheter with a sharply curved tip. The second problem with the approach was difficulty delivering additional coils. Because of the open ductus and the volume of flow through it, the first coil was comparatively easy to deploy, as it was naturally pulled by flow toward the ductal opening into the pulmonary artery. Additional coils, however, were more difficult to place, both because of the decreased available space in the ductus and the diminished flow that resulted from the first coil. Dog 1 was treated using the delivery catheter recommended by the manufacturer without modification. Multiple attempts to deliver a second coil from the carotid approach were unsuccessful, so a decision was made to place two additional coils from the traditional femoral artery approach. 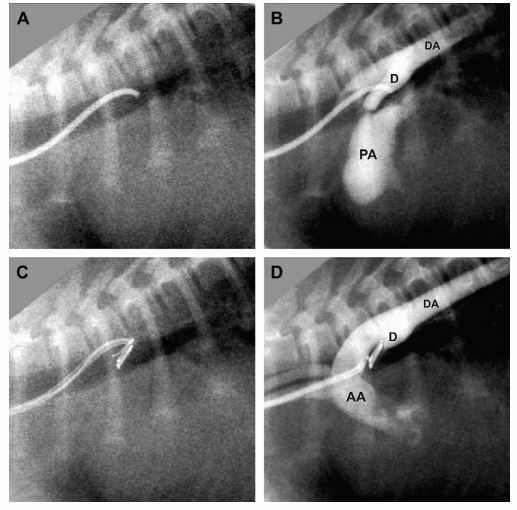 The original intent of this study was to determine if coil embolization of PDA might be possible using a carotid artery approach that might be applicable in very small dogs. Although 2 dogs in the study weighed less than 3 kg, none weighed less than 2 kg and most had narrow minimum ductal diameters. Additional experience will be required to determine the applicability of this technique in even smaller dogs. Although technically more demanding than the femoral arterial approach, PDA coil embolization using a carotid approach may be a viable option for some dogs, especially if only one coil is required to close the defect. The authors acknowledge the invaluable assistance of Denise Berger, RVT, principal Cardiology Service technician, in performing the clinical examinations and cardiac catheterization studies. Eyster GE, Eyster JT, Cords GB, Johnston J. Patent ductus arteriosus in the dog: characteristics of occurrence and results of surgery in one hundred consecutive cases. J Am Vet Med Assoc 1976;168:435-438. Birchard SJ, Bonagura JD, Fingland RB. Results of ligation of patent ductus arteriosus in dogs: 201 (1969-1988). J Am Vet Med Assoc 1990;196:2011-2013. Bureau S, Monnet E, Orton EC. Evaluation of survival rate and prognostic indicators for surgical treatment of left-to- right patent ductus arteriosus in dogs: 52 cases. J Vet Med Assoc 2005;227:1794-1799. Snaps FR, McEntee K, Saunders JH, Dondelinger RF. Treatment of patent ductus arteriosus by placement of intravascular coils in a pup. J Am Vet Assoc 1995;207: 724-725. Fox PR, Bond B, Sommer RJ. Nonsurgical transcatheter coil occlusion of PDA in two dogs using a preformed nitinol snare delivery technique. J Vet Intern Med 1998;12:182-185. Fellows C, Lerche P, King G, Tometzki A. Treatment of patent ductus arteriosus by placement of two intravascular embolisation coils in a puppy. J Small Anim Pract 1998;39: 196-199. Saunders JH, Snaps FR, Peeters D, Trotteur G, Dondelinger RF. Use of a balloon occlusion catheter to facilitate transarterial coil embolization of a patent ductus arteriosus in two dogs. Vet Rec 1999;145:544-546. Stokhof AA, Sreeram N, Wolvekamp WTC. Transcatheter closure of patent ductus arteriosus using occluding spring coils. J Vet Intern Med 2000;14:452-455. Tanaka R, Nagashima Y, Hoshi K, Yamane Y. Supplemental embolization coil implantation for closure of patent ductus arteriosus in a Beagle dog. J Vet Med Sci 2001;63: 557-559. Tanaka R, Hoshi K, Nagashima Y, Fujii Y, Yamane Y. Detachable coils for occlusion of patent ductus arteriosus in 2 dogs. Vet Surg 2001;30:580-584. Schneider M, Hildebrandt N, Schweigl T, Schneider I, Hagel K-H, Neu H. Transvenous embolization of small patent ductus arteriosus with single detachable coils in dogs. J Vet Intern Med 2001;15:222-228. Van Israel N, French AT. Retrieval of a patent ductus arteriosus coil following embolization to the right subclavian artery. J Small Anim Pract 2002;43:136-138. Hogan DF, Green HW, Gordon S, Miller MW. Transarterial coil embolization of patent ductus arteriosus in small dogs with 0.025-inch vascular occlusion coils: 10 cases. J Vet Intern Med 2004;18:325-329. Saunders AB, Miller MW, Gordon SG, Bahr A. Pulmonary embolization of vascular occlusion coils in dogs with patent ductus arteriosus. J Vet Intern Med 2004;18:663-666. Galal MO. Advantages and disadvantages of coils for transcatheter closure of patent ductus arteriosus. J Interv Cardiol 2003;16:157-163. Grifka RG, Miller MW, Frischmeyer K, Mullins CE. Transcatheter occlusion of patent ductus arteriosus in a Newfoundland puppy using a Gianturco-Grifka Vascular Occlusion Device. J Vet Intern Med 1996;10:42-44. Glaus TM, Berger F, Ammann FW, Kiowski W, Ohlert S, Boller M, Kastner S, Reusch CE, Sisson D. Closure of large patent ductus arteriosus with a self-expanding duct occluder in two dogs. J Small Anim Pract 2002;43: 547-550. Glaus TM, Martin M, Boller M, Johnson MS, Kutter A, Fluckiger M, Tofeig M. Catheter closure of patent ductus arteriosus in dogs: variation in ductal size requires different techniques. J Vet Cardiol 2003;5:7-12. Hogan DF, Green HW, Sanders RA. Transcatheter closure of patent ductus arteriosus in a dog with a peripheral vascular occlusion device. J Vet Cardiol 2006;8:139-143. Nguyenba TP, Tobias AH. Minimally invasive per-catheter patent ductus arteriosus occlusion in dogs using a prototype duct occluder. J Vet Intern Med 2008;22:129-134. Thomas WP, Sisson D. Cardiac catheterization and angiocardiography. In: Fox PR, Sisson D, Moise NS, editors. Textbook of canine and feline cardiology. 2nd ed. Philadelphia: WB Saunders; 1999. p. 173-192. Campbell FE, Thomas WP, Miller SJ, Berger DM, Kittleson MD. Immediate and late outcomes of trans-arterial coil embolization of patent ductus arteriosus in dogs. J Vet Intern Med 2006;20:83-96. Van Israel N, Dukes-McEwan J, French AT. Long-term followup of dogs with patent ductus arteriosus. J Small Anim Pract 2003;44:480-490. Goodrich KR, Kyles AE, Kass PH, Campbell FE. Retrospective comparison of surgical ligation and transarterial catheter occlusion for treatment of patent ductus arteriosus in two hundred and four dogs. Vet Surg 2007;36:43-49. Smith PJ, Martin MWS. Transcather embolisation of patent ductus arteriosus using an Amplatzer vascular plug in six dogs. J Small Anim Pract 2007;48:80-86. Nguyenba TB, Tobias AH. The AmplatzReg. Canine duct occluder: a novel device for patent ductus arteriosus occlusion. J Vet Cardiol 2007;9(2):109-117. Saunders AB, Miller MW, Gordon SG, Bahr A. Echocardio- graphic and angiographic comparison of ductal dimensions in dogs with patent ductus arteriosus. J Vet Intern Med 2007;21:68-75. Achen SE, Miller MW, Gordon SG, Saunders AB, Roland RM, Drourr LT. Transarterial ductal occlusion with the Amplatzer vascular plug in 31 dogs. J Vet Intern Med 2008;22(6): 1348-1352.